Keep up with our latest stories and updates! 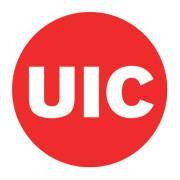 AMA UIC builds a Creative Agency Program (AMAgency ) to provide its members with real marketing experience! AMAgency is a creative agency program based on collaborating with other organizations on campus to market their events. We offer Video Ads, Flyers & Posters Designs, and multiple marketing strategies to help our clients in meeting their goals. Our members will be able to work in multiple departments including Account management, Strategy, Research and Creative based on their career interest.